"Dataviz" redirects here. For the software company, see DataViz. Data visualization is viewed by many disciplines as a modern equivalent of visual communication. It involves the creation and study of the visual representation of data. To communicate information clearly and efficiently, data visualization uses statistical graphics, plots, information graphics and other tools. Numerical data may be encoded using dots, lines, or bars, to visually communicate a quantitative message. Effective visualization helps users analyze and reason about data and evidence. It makes complex data more accessible, understandable and usable. Users may have particular analytical tasks, such as making comparisons or understanding causality, and the design principle of the graphic (i.e., showing comparisons or showing causality) follows the task. Tables are generally used where users will look up a specific measurement, while charts of various types are used to show patterns or relationships in the data for one or more variables. Data visualization is both an art and a science. It is viewed as a branch of descriptive statistics by some, but also as a grounded theory development tool by others. Increased amounts of data created by Internet activity and an expanding number of sensors in the environment are referred to as "big data" or Internet of things. Processing, analyzing and communicating this data present ethical and analytical challenges for data visualization. The field of data science and practitioners called data scientists help address this challenge. Data visualization is one of the steps in analyzing data and presenting it to users. 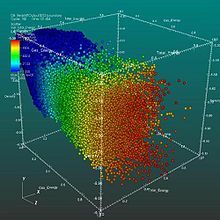 Data visualization refers to the techniques used to communicate data or information by encoding it as visual objects (e.g., points, lines or bars) contained in graphics. The goal is to communicate information clearly and efficiently to users. 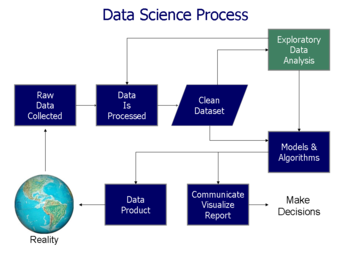 It is one of the steps in data analysis or data science. According to Friedman (2008) the "main goal of data visualization is to communicate information clearly and effectively through graphical means. It doesn't mean that data visualization needs to look boring to be functional or extremely sophisticated to look beautiful. To convey ideas effectively, both aesthetic form and functionality need to go hand in hand, providing insights into a rather sparse and complex data set by communicating its key-aspects in a more intuitive way. Yet designers often fail to achieve a balance between form and function, creating gorgeous data visualizations which fail to serve their main purpose — to communicate information". Indeed, Fernanda Viegas and Martin M. Wattenberg suggested that an ideal visualization should not only communicate clearly, but stimulate viewer engagement and attention. Data visualization is closely related to information graphics, information visualization, scientific visualization, exploratory data analysis and statistical graphics. In the new millennium, data visualization has become an active area of research, teaching and development. According to Post et al. (2002), it has united scientific and information visualization. Professor Edward Tufte explained that users of information displays are executing particular analytical tasks such as making comparisons. The design principle of the information graphic should support the analytical task. As William Cleveland and Robert McGill show, different graphical elements accomplish this more or less effectively. For example, dot plots and bar charts outperform pie charts. For example, the Minard diagram shows the losses suffered by Napoleon's army in the 1812–1813 period. Six variables are plotted: the size of the army, its location on a two-dimensional surface (x and y), time, direction of movement, and temperature. The line width illustrates a comparison (size of the army at points in time) while the temperature axis suggests a cause of the change in army size. This multivariate display on a two dimensional surface tells a story that can be grasped immediately while identifying the source data to build credibility. Tufte wrote in 1983 that: "It may well be the best statistical graphic ever drawn." Not applying these principles may result in misleading graphs, which distort the message or support an erroneous conclusion. According to Tufte, chartjunk refers to extraneous interior decoration of the graphic that does not enhance the message, or gratuitous three dimensional or perspective effects. Needlessly separating the explanatory key from the image itself, requiring the eye to travel back and forth from the image to the key, is a form of "administrative debris." The ratio of "data to ink" should be maximized, erasing non-data ink where feasible. The Congressional Budget Office summarized several best practices for graphical displays in a June 2014 presentation. These included: a) Knowing your audience; b) Designing graphics that can stand alone outside the context of the report; and c) Designing graphics that communicate the key messages in the report. A time series illustrated with a line chart demonstrating trends in U.S. federal spending and revenue over time. A scatterplot illustrating negative correlation between two variables (inflation and unemployment) measured at points in time. Time-series: A single variable is captured over a period of time, such as the unemployment rate over a 10-year period. A line chart may be used to demonstrate the trend. Ranking: Categorical subdivisions are ranked in ascending or descending order, such as a ranking of sales performance (the measure) by sales persons (the category, with each sales person a categorical subdivision) during a single period. A bar chart may be used to show the comparison across the sales persons. Part-to-whole: Categorical subdivisions are measured as a ratio to the whole (i.e., a percentage out of 100%). A pie chart or bar chart can show the comparison of ratios, such as the market share represented by competitors in a market. Deviation: Categorical subdivisions are compared against a reference, such as a comparison of actual vs. budget expenses for several departments of a business for a given time period. A bar chart can show comparison of the actual versus the reference amount. Frequency distribution: Shows the number of observations of a particular variable for given interval, such as the number of years in which the stock market return is between intervals such as 0-10%, 11-20%, etc. A histogram, a type of bar chart, may be used for this analysis. 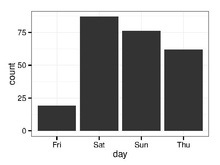 A boxplot helps visualize key statistics about the distribution, such as median, quartiles, outliers, etc. Correlation: Comparison between observations represented by two variables (X,Y) to determine if they tend to move in the same or opposite directions. For example, plotting unemployment (X) and inflation (Y) for a sample of months. A scatter plot is typically used for this message. 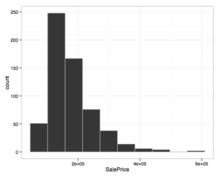 Nominal comparison: Comparing categorical subdivisions in no particular order, such as the sales volume by product code. A bar chart may be used for this comparison. Geographic or geospatial: Comparison of a variable across a map or layout, such as the unemployment rate by state or the number of persons on the various floors of a building. A cartogram is a typical graphic used. Analysts reviewing a set of data may consider whether some or all of the messages and graphic types above are applicable to their task and audience. The process of trial and error to identify meaningful relationships and messages in the data is part of exploratory data analysis. A human can distinguish differences in line length, shape, orientation, and color (hue) readily without significant processing effort; these are referred to as "pre-attentive attributes". For example, it may require significant time and effort ("attentive processing") to identify the number of times the digit "5" appears in a series of numbers; but if that digit is different in size, orientation, or color, instances of the digit can be noted quickly through pre-attentive processing. Almost all data visualizations are created for human consumption. Knowledge of human perception and cognition is necessary when designing intuitive visualizations. Cognition refers to processes in human beings like perception, attention, learning, memory, thought, concept formation, reading, and problem solving. Human visual processing is efficient in detecting changes and making comparisons between quantities, sizes, shapes and variations in lightness. When properties of symbolic data are mapped to visual properties, humans can browse through large amounts of data efficiently. It is estimated that 2/3 of the brain's neurons can be involved in visual processing. Proper visualization provides a different approach to show potential connections, relationships, etc. which are not as obvious in non-visualized quantitative data. Visualization can become a means of data exploration. There is no comprehensive 'history' of data visualization. There are no accounts that span the entire development of visual thinking and the visual representation of data, and which collate the contributions of disparate disciplines. Michael Friendly and Daniel J Denis of York University are engaged in a project that attempts to provide a comprehensive history of visualization. Contrary to general belief, data visualization is not a modern development. Stellar data, or information such as location of stars were visualized on the walls of caves (such as those found in Lascaux Cave in Southern France) since the Pleistocene era. Physical artefacts such as Mesopotamian clay tokens (5500 BC), Inca quipus (2600 BC) and Marshall Islands stick charts (n.d.) can also be considered as visualizing quantitative information. First documented data visualization can be tracked back to 1160 B.C. with Turin Papyrus Map which accurately illustrates the distribution of geological resources and provides information about quarrying of those resources. Such maps can be categorized as Thematic Cartography, which is a type of data visualization that presents and communicates specific data and information through a geographical illustration designed to show a particular theme connected with a specific geographic area. Earliest documented forms of data visualization were various thematic maps from different cultures and ideograms and hieroglyphs that provided and allowed interpretation of information illustrated. For example, Linear B tablets of Mycenae provided a visualization of information regarding Late Bronze Age era trades in the Mediterranean. The idea of coordinates was used by ancient Egyptian surveyors in laying out towns, earthly and heavenly positions were located by something akin to latitude and longitude at least by 200 BC, and the map projection of a spherical earth into latitude and longitude by Claudius Ptolemy [c.85–c. 165] in Alexandria would serve as reference standards until the 14th century. Invention of paper and parchment allowed further development of visualizations throughout history. Figure shows a graph from the 10th, possibly 11th century that is intended to be an illustration of the planetary movement, used in an appendix of a textbook in monastery schools. The graph apparently was meant to represent a plot of the inclinations of the planetary orbits as a function of the time. For this purpose the zone of the zodiac was represented on a plane with a horizontal line divided into thirty parts as the time or longitudinal axis. The vertical axis designates the width of the zodiac. The horizontal scale appears to have been chosen for each planet individually for the periods cannot be reconciled. The accompanying text refers only to the amplitudes. The curves are apparently not related in time. By the 16th century, techniques and instruments for precise observation and measurement of physical quantities, and geographic and celestial position were well-developed (for example, a “wall quadrant” constructed by Tycho Brahe [1546–1601], covering an entire wall in his observatory). Particularly important were the development of triangulation and other methods to determine mapping locations accurately. French philosopher and mathematician René Descartes and Pierre de Fermat developed analytic geometry and two-dimensional coordinate system which heavily influenced the practical methods of displaying and calculating values. Fermat and Blaise Pascal's work on statistics and probability theory laid the groundwork for what we now conceptualize as data. According to the Interaction Design Foundation, these developments allowed and helped William Playfair, who saw potential for graphical communication of quantitative data, to generate and develop graphical methods of statistics. In the second half of the 20th century, Jacques Bertin used quantitative graphs to represent information "intuitively, clearly, accurately, and efficiently". John Tukey and Edward Tufte pushed the bounds of data visualization; Tukey with his new statistical approach of exploratory data analysis and Tufte with his book "The Visual Display of Quantitative Information" paved the way for refining data visualization techniques for more than statisticians. With the progression of technology came the progression of data visualization; starting with hand drawn visualizations and evolving into more technical applications – including interactive designs leading to software visualization. Categorical: Text labels describing the nature of the data, such as "Name" or "Age". This term also covers qualitative (non-numerical) data. Quantitative: Numerical measures, such as "25" to represent the age in years. Two primary types of information displays are tables and graphs. A table contains quantitative data organized into rows and columns with categorical labels. It is primarily used to look up specific values. In the example above, the table might have categorical column labels representing the name (a qualitative variable) and age (a quantitative variable), with each row of data representing one person (the sampled experimental unit or category subdivision). A graph is primarily used to show relationships among data and portrays values encoded as visual objects (e.g., lines, bars, or points). Numerical values are displayed within an area delineated by one or more axes. These axes provide scales (quantitative and categorical) used to label and assign values to the visual objects. Many graphs are also referred to as charts. Eppler and Lengler have developed the "Periodic Table of Visualization Methods," an interactive chart displaying various data visualization methods. It includes six types of data visualization methods: data, information, concept, strategy, metaphor and compound. Comparison of values, such as sales performance for several persons or businesses in a single time period. For a single variable measured over time (trend) a line chart is preferable. Determining frequency of annual stock market percentage returns within particular ranges (bins) such as 0-10%, 11-20%, etc. The height of the bar represents the number of observations (years) with a return % in the range represented by the bin. 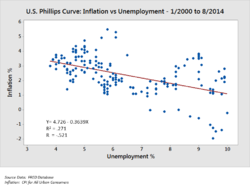 Determining the relationship (e.g., correlation) between unemployment (x) and inflation (y) for multiple time periods. Finding clusters in the network (e.g. grouping Facebook friends into different clusters). Determining the most influential nodes in the network (e.g. A company wants to target a small group of people on Twitter for a marketing campaign). 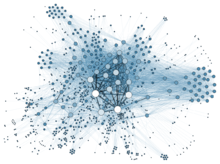 Finding outlier actors who do not fit into any cluster or are in the periphery of a network. Analyzing risk, with green, yellow and red representing low, medium, and high risk, respectively. All these subjects are closely related to graphic design and information representation. Data presentation architecture (DPA) is a skill-set that seeks to identify, locate, manipulate, format and present data in such a way as to optimally communicate meaning and proper knowledge. Historically, the term data presentation architecture is attributed to Kelly Lautt:[a] "Data Presentation Architecture (DPA) is a rarely applied skill set critical for the success and value of Business Intelligence. Data presentation architecture weds the science of numbers, data and statistics in discovering valuable information from data and making it usable, relevant and actionable with the arts of data visualization, communications, organizational psychology and change management in order to provide business intelligence solutions with the data scope, delivery timing, format and visualizations that will most effectively support and drive operational, tactical and strategic behaviour toward understood business (or organizational) goals. DPA is neither an IT nor a business skill set but exists as a separate field of expertise. Often confused with data visualization, data presentation architecture is a much broader skill set that includes determining what data on what schedule and in what exact format is to be presented, not just the best way to present data that has already been chosen. Data visualization skills are one element of DPA." Business analysis in determining business goals, collecting requirements, mapping processes. Data visualization in that it uses well-established theories of visualization to add or highlight meaning or importance in data presentation. Information architecture, but information architecture's focus is on unstructured data and therefore excludes both analysis (in the statistical/data sense) and direct transformation of the actual content (data, for DPA) into new entities and combinations. HCI and interaction design, since the many of the principles in how to design interactive data visualisation have been developed cross-disciplinary with HCI. Visual journalism and data-driven journalism or data journalism: Visual journalism is concerned with all types of graphic facilitation of the telling of news stories, and data-driven and data journalism are not necessarily told with data visualisation. Nevertheless, the field of journalism are at the forefront in developing new data visualisations to communicate data. Graphic design, conveying information through styling, typography, position, and other aesthetic concerns. ^ The first formal, recorded, public usages of the term data presentation architecture were at the three formal Microsoft Office 2007 Launch events in Dec, Jan and Feb of 2007–08 in Edmonton, Calgary and Vancouver (Canada) in a presentation by Kelly Lautt describing a business intelligence system designed to improve service quality in a pulp and paper company. The term was further used and recorded in public usage on December 16, 2009 in a Microsoft Canada presentation on the value of merging Business Intelligence with corporate collaboration processes. ^ a b Michael Friendly (2008). "Milestones in the history of thematic cartography, statistical graphics, and data visualization". ^ a b "Stephen Few-Perceptual Edge-Selecting the Right Graph for Your Message-2004" (PDF). ^ Nikos Bikaks (2018) "Big Data Visualization Tools" Encyclopedia of Big Data Technologies, Springer 2018. ^ Press, Gil. "A Very Short History Of Data Science". ^ Vitaly Friedman (2008) "Data Visualization and Infographics" in: Graphics, Monday Inspiration, January 14th, 2008. ^ a b Frits H. Post, Gregory M. Nielson and Georges-Pierre Bonneau (2002). Data Visualization: The State of the Art. Research paper TU delft, 2002. Archived 2009-10-07 at the Wayback Machine. ^ Tukey, John (1977). 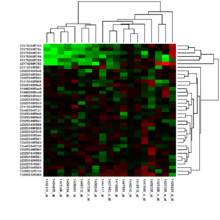 Exploratory Data Analysis. Addison-Wesley. ISBN 0-201-07616-0. ^ techatstate (7 August 2013). "Tech@State: Data Visualization - Keynote by Dr Edward Tufte" – via YouTube. ^ a b c Tufte, Edward (1983). The Visual Display of Quantitative Information. Cheshire, Connecticut: Graphics Press. ISBN 0-9613921-4-2. ^ "Telling Visual Stories About Data - Congressional Budget Office". www.cbo.gov. ^ "Stephen Few-Perceptual Edge-Graph Selection Matrix" (PDF). ^ a b "Steven Few-Tapping the Power of Visual Perception-September 2004" (PDF). ^ a b c "Data Visualization for Human Perception". The Interaction Design Foundation. Retrieved 2015-11-23. ^ "Visualization" (PDF). SFU. SFU lecture. Retrieved 2015-11-22. ^ a b c Friendly, Michael. 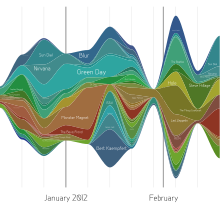 "A Brief History of Data Visualization". Springer-Verlag. Retrieved 19 November 2017. ^ Whitehouse, D. (9 August 2000). "Ice Age star map discovered". BBC News. Retrieved 20 January 2018. ^ Dragicevic, Pierre; Jansen, Yvonne (2012). "List of Physical Visualizations and Related Artefacts". Retrieved 2018-01-12. ^ Jansen, Yvonne; Dragicevic, Pierre; Isenberg, Petra; Alexander, Jason; Karnik, Abhijit; Kildal, Johan; Subramanian, Sriram; Hornbaek, Kasper (2015). "Opportunities and challenges for data physicalization". Proceedings of the 33rd Annual ACM Conference on Human Factors in Computing Systems: 3227–3236. ^ a b Friendly, Michael (2001). "Milestones in the history of thematic cartography, statistical graphics, and data visualization". Retrieved 2017-11-19. ^ Funkhouser, Howard Gray (Jan 1936). "A Note on a Tenth Century Graph". Osiris. 1: 260–262. doi:10.1086/368425. JSTOR 301609. ^ Friendly, Michael (2006). "A Brief History of Data Visualization" (PDF). York University. Springer-Verlag. Retrieved 2015-11-22. ^ "NY gets new boot camp for data scientists: It's free but harder to get into than Harvard". Venture Beat. Retrieved 2016-02-21. ^ "Steven Few-Selecting the Right Graph for Your Message-September 2004" (PDF). ^ Lengler, Ralph; Eppler, Martin. J. "Periodic Table of Visualization Methods". www.visual-literacy.org. Retrieved 15 March 2013. ^ Frits H. Post, Gregory M. Nielson and Georges-Pierre Bonneau (2002). Data Visualization: The State of the Art Archived 2009-10-07 at the Wayback Machine. Cleveland, William S. (1993). Visualizing Data. Hobart Press. ISBN 0-9634884-0-6. Evergreen, Stephanie (2016). Effective Data Visualization: The Right Chart for the Right Data. Sage. ISBN 978-1-5063-0305-5. Post, Frits H.; Nielson, Gregory M.; Bonneau, Georges-Pierre (2003). Data Visualization: The State of the Art. New York: Springer. ISBN 978-1-4613-5430-7. Wilke, Claus O. (2018). Fundamentals of Data Visualization. O'Reilly. ISBN 978-1-4920-3108-6. Wilkinson, Leland (2012). Grammar of Graphics. New York: Springer. ISBN 978-1-4419-2033-1. 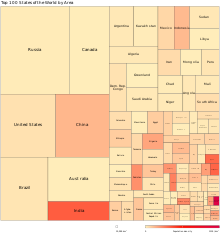 Wikimedia Commons has media related to Data visualization.